Black V Neck Star Sleeve Dress is rated 3.0 out of 5 by 1. 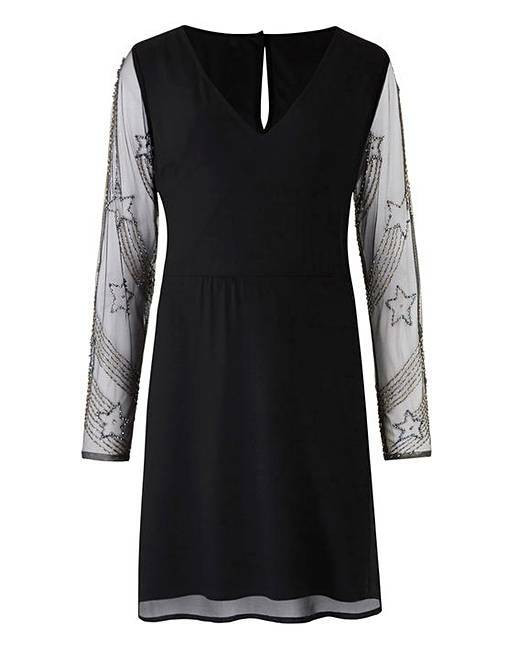 You'll be sure to shine in the Star Sleeve Dress this season. The mesh dress features embellished sequin stars along the sleeves and neck, embracing key trends. Perfect for your winter parties this Christmas, the wrap front will also complement your figure making you look and feel amazing. Style with your favourite heels and clutch bag to complete your going-out look. 77% Polyester, 20% Viscose, 3% Elastane. Sequin: Polyester. Mesh: Polyester. Rated 3 out of 5 by Tracy from Nice dress Nice dress, shame it doesn't come with the belt. Unable to find belt on website to order!